Despite being around for a few years already, consumer 360° cameras are still very niche products that even professional creators are still figuring out how to utilize them as creative tools. It is also safe to say that the 360° format is still very much in its infancy, but I digress. Getting started in 360° photography and videography is now easier and more affordable than ever. Nowadays, it’s very easy to pick up a simple 360° camera and join the crusade in finding ways that we can use these cameras as creators. 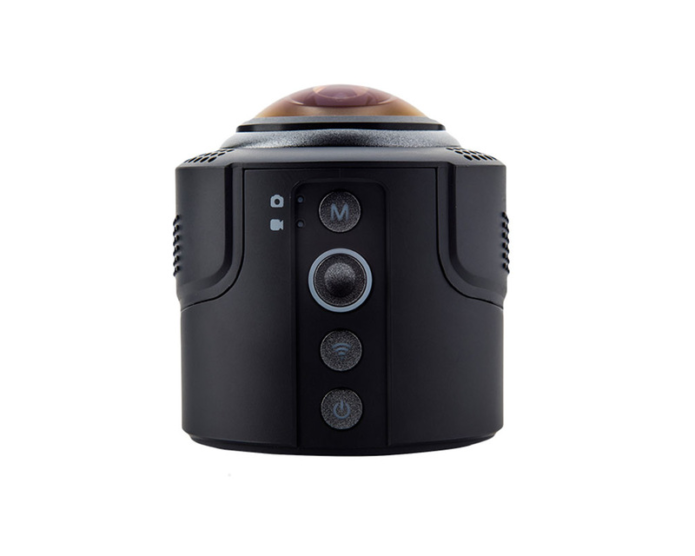 One such camera is the DETU Sphere S, a tiny bullet-shaped camera that you use by pairing it with your smartphone. On the surface, it looks very simple, but is that where its simplicity ends? The answer to that question will be tackled later on in the review. To begin, let’s take it out of the box. The unit just comes in a simple black cardboard box with yellow text labels. Inside, you will find the Sphere S itself, a micro-USB charging cable, cleaning cloth, a mount to attach to various accessories, and a small cloth bag to keep everything. Moving on to the camera itself, as I said earlier, it sort of looks like a bullet. The entire body is made of plastic, save for the glass on the lens and the tripod mounting hardware. The majority of it is shaped like a cylinder with a flat edge, with the lens on top being a half-sphere since this is a 360° camera. Up top, we have four buttons. There is one for switching between photo and video mode, the actual shutter button, the Wi-Fi connection button, and of course the power button. At the bottom, we have the 1/4″-20 thread for mounting to something like a tripod, and a rubber flap that protects the micro-USB port, micro HDMI port, and micro SD card. Adjacent to these sides is the actual camera lens, which needs to be protected from drops and scratches at all times as it is completely made of glass. It is surrounded by some audio grilles. The Sphere S is quite comfortable to hold in the hands as it is very light, though not too small. It also has some embossed dots in some spots on the sides for a more firm grip. The design is good, but the software experience and camera quality are where the Sphere S starts to fall apart. To actually use the camera, you need to install the DETU Sphere app on your smartphone. As mentioned in our review of the DETU Twin, the company has a lot of apps on the Google Play and Apple App stores, be sure to download the right one. Connection to the Sphere S is via Wi-Fi, and it actually works pretty quickly. The interface of the application is gorgeous, keeping things simple but nice to look at. From the app, you can control the camera, view photos and videos saved on the camera, your phone, or the cloud, and there is a built-in panoramic player. There is a Discover tab that we would assume is to see what other people are doing with their Sphere S, but unfortunately, it appears to be region-locked, and does not work in the Philippines. When using the app to access live view on the Sphere S, there is naturally some delay, but it isn’t that distracting. Using it is straightforward, and it gives you access to some pretty neat tools. You can change your view to either Fish Eye, Panorama, Planet, or VR, and you can switch the orientation that the camera records based on its real-world orientation. This all sounds very promising, but it was all for naught, as actually using the 360° capabilities is easier said than done. Basically, you can only use the app itself to see all the 360° functionality including Panoramic and VR viewing. We tried to remedy this by using the DETU Play Desktop app to import and export the files, but it appears that Facebook and Google platforms do not support the camera just yet, and do not recognize the metadata required to display 360° content. For now, the output from the camera that we have are these circular fish eye type of shots that we cannot manipulate outside of the mobile or desktop app. We realize that there are workarounds for this, but should it really be that difficult, since this is a consumer-grade camera? Nevertheless, we find the color and dynamic range of the photos to be very good, though detail is lacking. We can say the same about the videos. It’s definitely worth mentioning that under the lens is a 12-Megapixel Sony sensor. Audio quality leaves a lot to be desired, but to ask for good audio from the device would be asking too much. Battery life is pretty respectable, as you can comfortably use the device for 50-60 minutes before you feel the need to plug it in and top it up. It’s worth noting that it heats up quite a bit after some use, and that’s considering that most of our testing was done in 5-10°C temperatures. The DETU Sphere S had a lot going for it in the initial use, but fell flat due to software-related issues. Both the mobile and d and desktop apps are well-designed, but could use an update in terms of functionality and compatibility with the platforms that users would want to share their 360° content on. It still gets a mild recommendation from us, as we really liked its design, ease of use, and its potential. If the software issues are to be ironed out within the near future, then you might not want to shut the door on the DETU Sphere S just yet.